A Saturday walk to grab some Christmas stuff and a cup of coffee. Weather was alright, almost near zero degrees Celsius and I found my navy odd jacket and my pea coat quite comfortable, almost too warm. 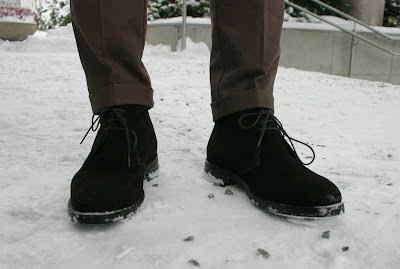 I've been looking for a pair of chocolate brown chinos for ages, and was able to find a pair for just 45 euros from Yoox the other week. After having them tailored to fit me, I wanted to break them out. 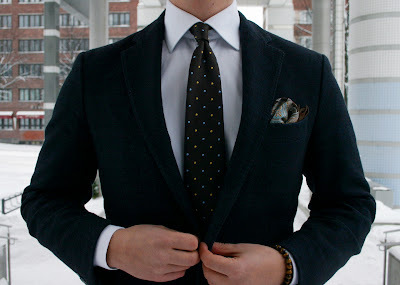 Didn't think much what else to put on, so I ended up leaving home with a navy jacket, brown pin dot silk tie and a semi-spread collar white poplin shirt. Other accesories include a brown stone bracelet, silk pocket square and a brown suede belt. 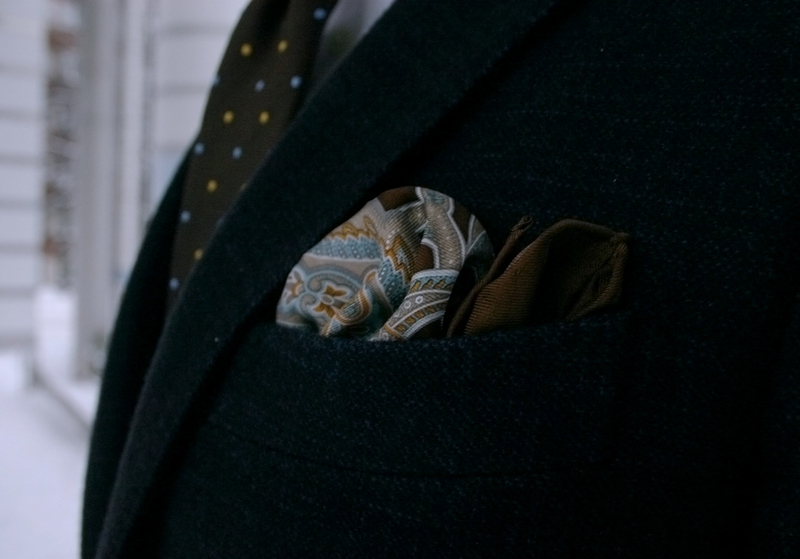 The pocket square is one that I've bought off Styleforum some years ago for about 15 dollars. The pattern includes brown, golden and blue hues. 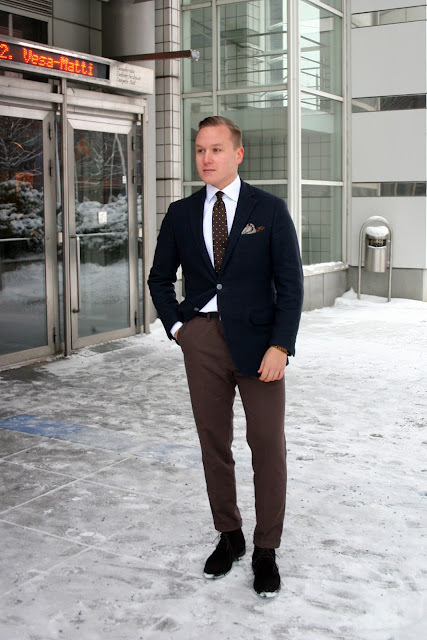 Really like the color on the chinos. Here with my suede chukka boots, but what I'm really looking forward is to be able to wear them with some suede tassel loafers next spring. Last picture to show what was on my jacket. 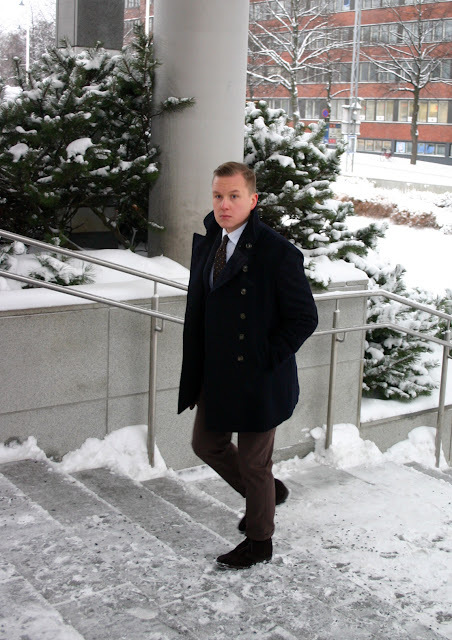 At first I had some problems hammering the idea of wearing a pea coat on top into my head, but after some soul searching and propaganda from some of my friends I've actually grown to like it that way, provided all the pieces work together. They sure can and probably are my favorite colors. Can you link the pants? Been looking for months! Heh, I always liked using browns so I've been looking for a pair for a longer time. Quite happy with them, the fabric is at least on par with PRL chinos.